Agronomy encompasses both soil and plant sciences associated with field crops and pastures and is directly responsible for the production of most food and fibre consumed and utilised by people and livestock. Agronomists are plant and soil scientists who develop innovative farm practices and technologies that not only boost crop yields but also control pests and weeds and protect the environment. Agronomists are also professional practitioners, educators, and advisers who work directly with farmers, and companies, to implement the latest methods and tools for growing crops profitably and sustainability. 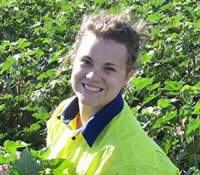 The average salary for an agronomist in Australia is $85,249 P/A and there is 37% job growth in this field in NSW. (Seek Learning). Be able to analyse and solve problems, enjoy agriculture and the environment and be able to make accurate observations. Have excellent oral and written communication skills and the ability to work well within a team and enjoy working outdoors. If you are in high school - keep taking science and mathematics subjects.